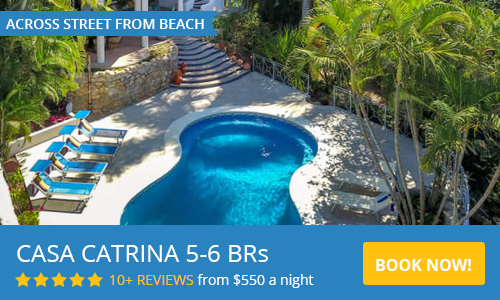 Casas Palmar and Tocayo in Sayulita are located in the beautiful beachfront Villas del Palmar complex on the north side of town. With a huge swimming pool, steps from the sand, and just a 3-5 minute walk to town and restaurants. Located right in front of the left surf break, this is the perfect home for families or friends traveling together. Casas Palmar and Tocayo are adjacent to one another, each home has 4 bedrooms, 3 or 4 baths and 2 kitchens, for a total of 8 bedrooms, 8 baths, 4 kitchens, and sleeps up to 20 guests, 16 adults and 4 children. Each home has three individual units, the large 1 BR ground level apartments have king size beds, with small attached room with twin bunks, luxury open air kitchens and sofa seating area and bar. The second floor apartments have 2 air conditioned bedrooms, one with King size bed and the other with Queen and two individual beds, each bedroom has a private bath with shower. The rooftop suites both have one large bedroom with a super quality king size mattress, and a small sofa, chaise lounges and a hammock are available outside on the patio. The suite is air conditioned and the bathroom is huge and includes two showers, an integrated open air bathtub, and a bench along one entire wall, above the sink is a window that looks to the Pacific. The location is perfect. It is a 3 minute walk to town (yet without the noise of downtown), restaurants, shops and activities steps away, market around the corner, directly in front of the left surf break, and just about as close as you can be to the ocean. You do not need a car once you are here and there are no steep hills to climb, but some enjoy renting a golf cart for running around town. If you need less room, the homes can be rented individually, Casa Palmar here and Casa Tocayo here. Please use the contact form to get in touch with any questions and to request a reservation for your group. This was our third family trip to the area and WOW! If only I had found this place sooner. The location is prime--seriously, it does not get better than this. Located inside a small gated community, it is right on the beach and next to the swimming pool. The outdoor living spaces do not disappoint with breathtaking views. If you walk out the front, you are five minutes away from downtown Sayulita. The location is everything you would want it to be--on the beach and walking distance to the shops and restaurants. Inside, the house was spectacular--comfortable beds, large rooms, lots of sitting areas in/outdoors, amazing bathrooms, and the kitchens are great too! You also have access to beach chairs, boogie boards, umbrellas, sand toys, beach towels, etc. I’m so glad we found this little piece of paradise. Luke has a beautiful home and I’m sure you will love it as much as we did! Already miss that amazing view of the ocean! Had a fabulous three-generation family vacation & everyone had a great time. Clean & comfortable home in a secure community; sleek concrete finishes made everything relaxed. Location perfect! Beach front, poolside, cafes right outside the gate & 5-minute walk to center of town. Don't miss the best margaritas in Sayulita at La Sirena bar on the beach, next to the massage tent. Yes - margaritas & massages right on the beach just steps away. Can't wait for our next visit. We stayed at Casa Tocayo Just after Christmas. We loved the accommodations and the location. Perfect for our Family of 13 ranging in kid ages from 12 to 24. Two of us stayed next door at Casa Palmar in the penthouse. Great outdoor/indoor spaces. Comfortable with lots of beach towels and chairs. We spent our days lounging at the beach, surfing and playing cards. Kitchen are fully equipped. Easy walk to Sayulita main square, no noise. Would not hesitate to recommend, we will be back. This place was everything we expected and so much more. Great place to stay for a group as varied in ages as we were. We were close to town, so those not interested in beach coming could go into town easily. Surfing was just a few steps from the house. Several restaurants were just around the corner so eating out was easy. Maid service was great and having a washer and dryer available allowed us to pack lightly. Best way to get to Sayulita, fly to Puerto Vallarta and take a van from there. No need to rent a car. Our group of loved this place! It had everything we needed for everyone, we had kids from age 5-22, and they all had a great time. Whether they wanted to be in pool or on the beach, both are steps away and can be seen from house. Plenty of fresh water and cooking needs, we had everything we needed. Muchas gracias to Lucas and Brenda the housekeeper! Casa Tocayo is on the beach, literally steps away, and then a 5 min walk along the beach to bring you to the bars/restaurants/sun loungers. The houses laid out on 3 levels, you can rent one or all. Extremely clean, well stocked with beer (great on arrival), coffee and water. Towels and sheets changed daily, unit cleaned daily. Good fans, air conditioning and wifi. Security in the area right and day (not that it's needed, feels very safe). Very close to downtown without having the noise of downtown. If you want a break from Mexican food, the best pizza in town is just outside on the street level. Highly recommended and you can also rent the house next door if you have a large group. Pool is located right out your front door and the ocean and beach is just steps away. Pair it up with Casa Tocayo (next door) and there is plenty of room for large family get together. Seasonal rates are per night and in US Dollars. Maid service included 5 days per week. Casas Palmar and Tocayo can accommodate 16 adults and 4 children.